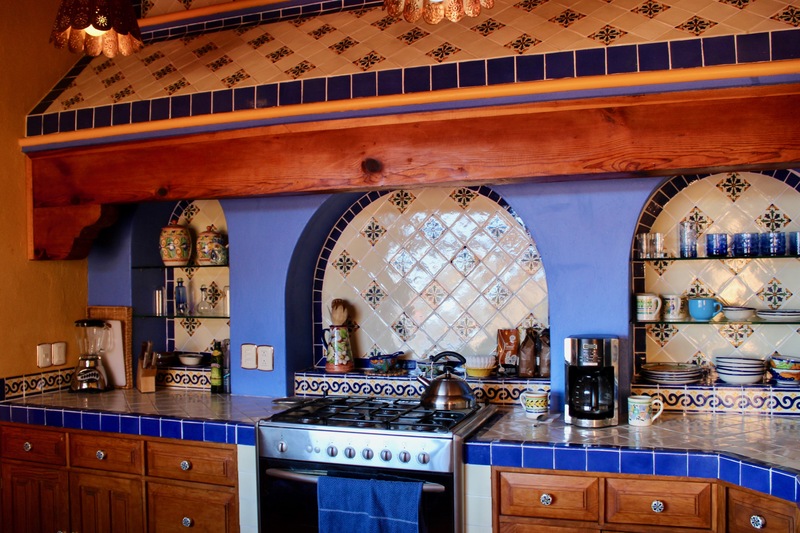 Our lovely casita rental includes a weekly cleaning service – which we much appreciate; and, though we really don’t get our nest too messy (as evidenced in the photo), it is nice to have things freshened. Our gals (they are always gals) arrive promptly at 10am, and we leave the house until they are finished – which means being gone until at least 4pm. It is not as if they are slow (though they do keep a pretty moderate pace), but they are extremely thorough. All sheets and towels get changed; floors get mopped; bathrooms get sanitized; shelves and objects on them get dusted; patio furniture is wiped down and even the outdoor areas get wet-broomed. Like I said – thorough. When we came to Mexico this year I brought along my sewing machine and much of what I needed for 2-3 projects. I had already made dear grandson, Harper, a couple of pillow cases: one to commemorate his holiday trip to Guanajuato and another for his first birthday – coming up in a couple of months. Now I was itching to begin a quilt using precut squares I got when friends and I visited Hamilton, Missouri this past spring. The decision was to find some deep gray for the background. I checked fabric stores in Guanajuato – no luck. In fact, no 100% cotton fabric was available anywhere. Definitely had to expand the search. Down the street from Telas Biba was an interesting square and church. The street lamp and the saint caught my eye. In truth, the light pole is behind the arch, but the perspective created an interesting illusion. The parking garage we used had to be near a police station. We never identified the building itself, but there were blocks of parked Policia Federal cars. The weekend was the celebration of the Feast of Three Kings. These fellows, and many others just like them, were working the streets. Their goal was to get people to buy Rosca de Reyes, a sweet bread with a plastic figure of the baby Jesus baked inside. These breads also come with packets of white frosting and bags of colored sugar to sprinkle on top. Makes my teeth ache to think of it. If you didn’t buy your bread from the street venders, you could also pick it up at a grocery store. Or favorite store bakery had racks full. Back to Guanajuato for our movie. The mall was filled with families and children enjoying the stage shows. Love your adventures–you make life there sound so comfortable! Thanks, Linda. We have been fortunate to land in a nicely feathered nest. Guanajuato is a gem of a place to spend time. Greet the book club gals for me when next you see them. I just finished another Willy Vlautin – The Free. Not sure what I think yet… needs time to percolate.